This video demonstrates the digital creation of a profile line i.e. drawing of a ceramic fragment, which was captured using a 3D-scanner. Such fragments also known as sherds are among the most common findings at archaeological excavations. The rim sherd shown as an example was part of a bowl. It was found 2017 during excavations in the Roman vicus of Gleisdorf, Styria, Austria. It belongs to a group of fine ware which is called "Pannonische Glanztonware“ (PGW, Pannonian glazed pottery), which was produced between flavian times and the beginning of the 3rd century AD. PGW imitated Samian Ware vessels regarding their forms and also decorations. Usually burnt in a de-oxidizing atmosphere in the kiln and therefor black or grey, the example shown was burnt in an oxidizing atmosphere and is therefore of orange color. 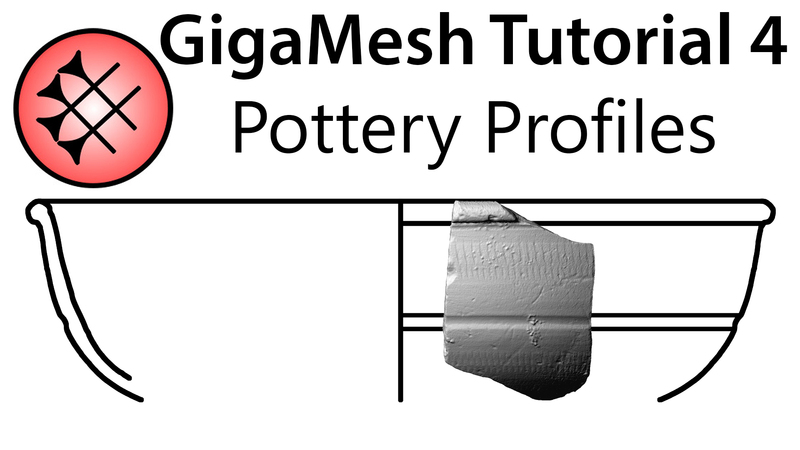 Related publications for computing drawings of ceramic fragments are:  Hubert Mara, Martin Kampel and Robert Sablatnig, “Preprocessing of 3D-Data for Classification of Archaeological Fragments in an Automated System“, in: Leberl F., Fraundorfer F., (Eds. ), “Vision with Non-Traditional Sensors, Proc. of the 26th Workshop of the Austrian Association for Pattern Recognition (OEAGM)“, Schriftenreihe der OCG, Vol. 160, pp. 257-264, 2002. Robert Sablatnig and Hubert Mara, "Orientation of Fragments of Rotationally Symmetrical 3D-Shapes for Archaeological Documentation," 3D Data Processing Visualization and Transmission, International Symposium on(3DPVT), University of North Carolina, Chapel Hill, USA, 2006, pp. 1064-1071. doi:10.1109/3DPVT.2006.105  Hubert Mara and Julia Portl, “Acquisition and Documentation of Vessels using High-Resolution 3D-Scanners”, in: Trinkl E., Corpus Vasorum Antiquorum Österreich-Beiheft 1, pp. 25-40, Verlag der Österreichischen Akademie der Wissenschaften, Vienna, Austria, 2013.